But only 17 were ever made, and when it's cleaned up and auctioned in Paris next month, experts believe it will fetch at least 3 million pounds ($4.3 million) and possibly much more. Bugatti once represented the height of motoring achievement. The supercar was so ahead of its time it could go up to 130 mph (209 kph) when most other cars topped out about 50 mph (80 kph). 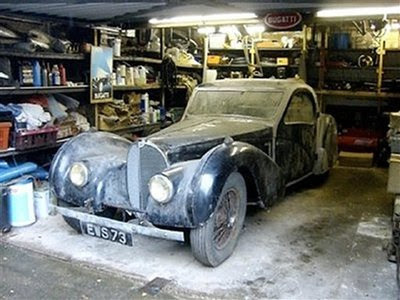 This particular car is even more valuable because it was originally owned by Earl Howe, a prominent British race car driver, and because its original equipment is intact, so it can restored without relying on replacement parts. "It has all the finest attributes any connoisseur collector could ever seek, in one of the ultimate road-going sports cars from the golden era of the 1930s," said James Knight, head of the international motoring department at Bonhams, which will auction the car Feb. 7.